New York: E. P. Dutton, 1908. 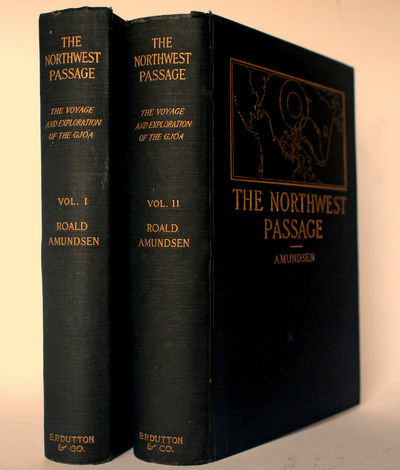 First American edition, published from the London sheets.. First American edition (from the London plates) of the first English translation of Amundsen's account of the three-year journey through the Northwest Passage from the Atlantic Ocean to the Pacific (a goal that had eluded explorers for centuries). Amundsen's success was due in part to his choice of a small, shallow-bottomed ship capable of squeezing through shoreline channels that heavier vessels could not manage.. 24 cm; 2 volumes. Frontispieces, 3 color maps, two of them folding; 139 black-and-white photo illustrations. Publishers original black cloth-covered boards stamped in gilt with a map tracing Amundsen's route from Norway to Nome, Alaska (different from the design on the British edition). Top edge gilt. Very minor wear at spine edges, else fresh, crisp, and blemish-free. References: Tourville, 227 (London edition); Arctic Bibliography # 402 (London ed. ).